The malachite sunbirds in our garden love feeding on the nectar of aloes in winter, providing some excellent photo opportunities. The only downside is that they're usually in non-breeding, or "eclipse" plumage, that in-between stage found in birds that do exhibit a distinct breeding plumage. However, I was rewarded in spring when a male malachite in its full breeding plumage posed briefly for me on a wild pomegranate. 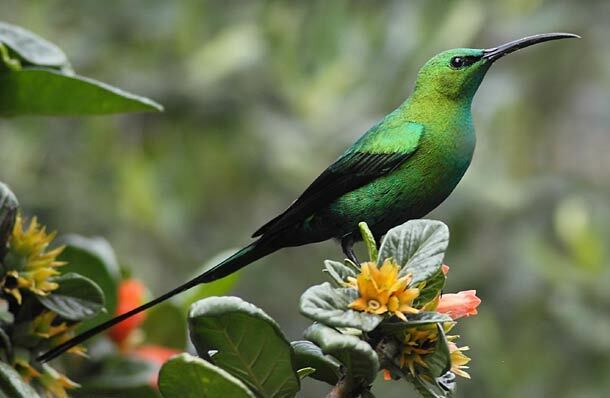 As can be seen, the sunbird is now entirely iridiscent green except for the blue-black wings and tail.